ONE of he least frequently seen yet most important types of merchant craft is the cable vessel. These craft are employed for repairing the marine cables which form the vital links of world communication. The ships have two main functions. They lay the cable - an operation which is done by special machinery over the stern - or they pick up the cable and make any repairs that may be necessary after damage in a storm. 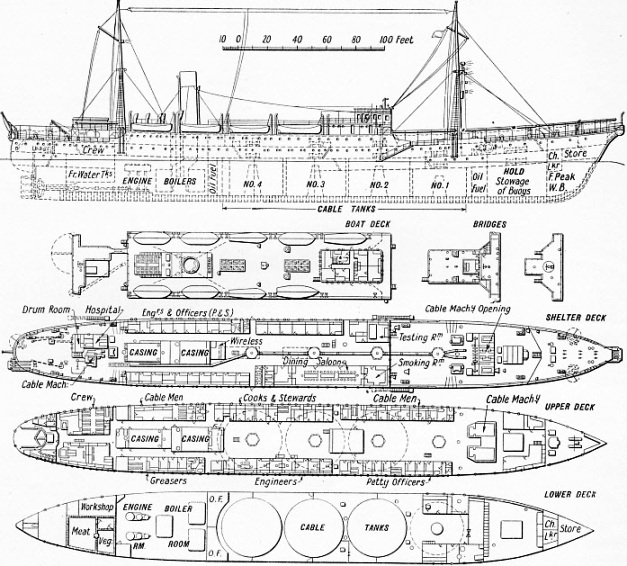 The drawing of the Faraday (above) shows that she has four cable tanks. The ship has a clipper stem adapted for carrying three cable sheaves, and a cruiser stern with two sheaves on the starboard side. There is also a large hold forward of the cable tanks for stowing buoys and other gear incidental to cable work. The ship has two complete decks designated shelter deck and upper deck respectively. Above the shelter deck is a long boat deck. There is also a lower deck beneath the upper deck outside the limits of the machinery space. The shelter deck is the working platform for cable repairing, testing, jointing and the like; at the bow are three cable sheaves. Immediately forward of the main cable machinery hatch is a dynamometer for registering the pull of the cable, and abaft this hatch is a steel house and shelter for the control gear to the picking up machinery. The main propelling machinery consists of twin sets of three-crank triple-expansion engines. Collectively they are designed to develop 2,960 ihp when running at about 88 revolutions a minute; but, as with most cable ships, it is necessary for the Faraday sometimes to run with the engines just “ticking over”. Her engines can drive the vessel, if necessary, at three-quarters of a knot. The Faraday has a length between perpendiculars of 394 ft 4-in. She has an extreme breadth of 48 ft 3-in and a draught of 27 ft 5¾-n. Her gross tonnage is 5,533.